The Fort Kent Community High School boys and girls ski teams took first place in both the morning and afternoon races during an Alpine ski meet at Bigrock Mountain in Mars Hill on Saturday, Jan. 26. FORT KENT, Maine — The Fort Kent Community High School boys and girls ski teams took first place in both the morning and afternoon races during an Alpine ski meet at Bigrock Mountain in Mars Hill on Saturday, Jan. 26. 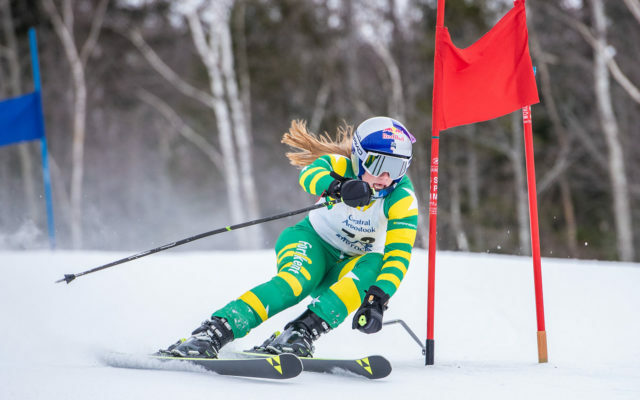 The Warriors competed in giant slalom races against teams from Central Aroostook, Presque Isle, Caribou and Greenville. One athlete from Madawaska and two from Wisdom train with the Fort Kent skiers. The Caribou Vikings boys team took second in both races, as did the Presque Isle girls team. In the boys morning race, Warrior Austin Plourde topped the leaderboard with a 1:25.59 finish between two course runs. Pierre Hickey of Madawaska followed with a time of 1:26.10. Bryce Madore of Fort Kent rounded out the top three at 1:26.40. During the afternoon boys race, Wisdom’s Jake Roy finished first with a time of 1:23.44. Madore took second at 1:25.34, followed by Hickey in third place, 1:26.36. Warrior skiers cleaned up the top three in the girls morning race. Lyndsay Ouellette took the top spot with a time of 1:30.01. Riley Sibley followed at 1:34.65. In third was Sylvie Guimond, 1:36.41. Ouellette once again prevailed in the afternoon race with a time of 1:29.56, followed by Sibley with 1:32.42. Viking Edie Shea finished in third at 1:36.75.